Amy Sabrin knew she was an artist by the time she was three years old. Not a scrap of paper in her house was safe from her early doodles. She continued to pursue artistic interests both as an art history major in college and in her adult life as a recreational painter. But it was not until she retired from a distinguished career, first as a journalist and then as an attorney and partner at Skadden, Arps, Slate, Meagher and Flom LLP, that she came into her own as a painter. Fresh Pond III captures a summer evening. “I retired with the intent to spend time painting,” Sabrin says. That time has been well-spent, as can be seen in her current Touchstone Gallery show, A Fresh Look. 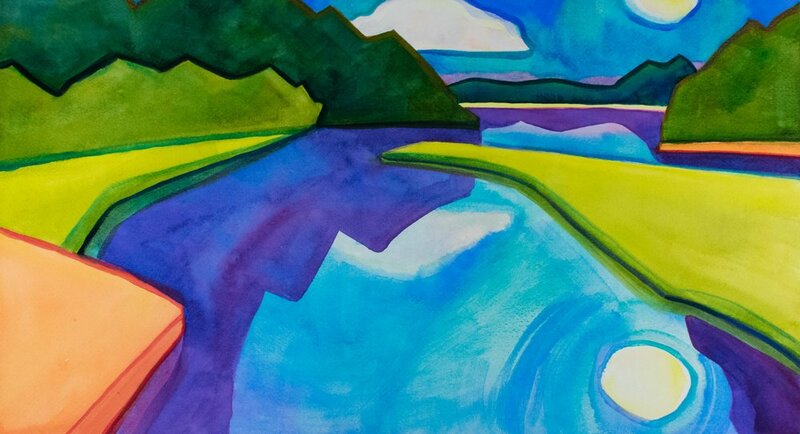 The paintings reflect her love of the outdoors and water as well as her strong sense of shape, color and light. Sabrin divides her time between Washington, D.C. and Bethany Beach. 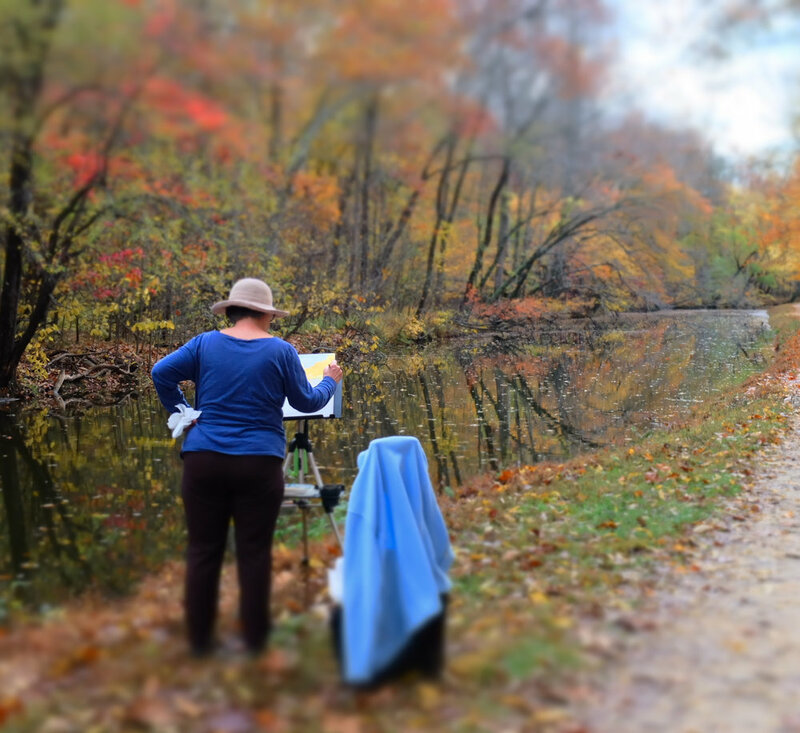 She enjoys plein air painting late in the day and frequents wildlife reserves, marshes and watersides in both areas. A Fresh Look was born of an outing to paint on the beach near her home in Bethany. The unusual shape of a curved gully caught her eye, but the work she created on site didn’t quite capture the moment, so she took a lot of pictures and headed to the studio. An attempt to paint the scene realistically wasn’t satisfying, so she painted it again. And again. And again. With each iteration, the image became more abstract. Primehook Marsh I reflects the evening sky. The clouds in Bridge to Burton Island drip into the water below. Sabrin says that the act of painting gives her great pleasure. As an attorney, she spent her days talking, arguing, and engaging in very linear, word-oriented activities. During that time, painting provided a form of relaxation and an opportunity to do something nonverbal using the right side of her brain. Her life is less intense now, but she still loves being alone in her studio. Amy Sabrin’s art is rooted in her love of the outdoors. 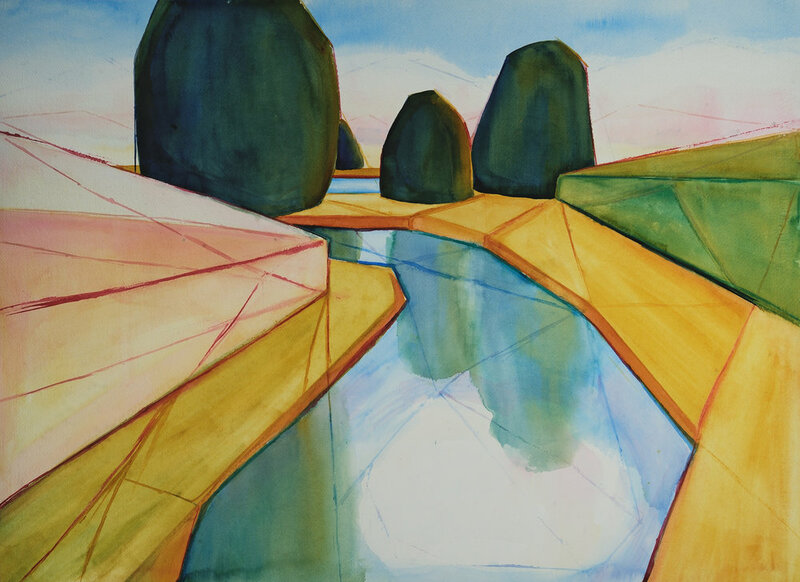 Her ideas come from plein air painting that she later transforms in the studio. As Sabrin’s work has become more abstract, she has also been drawn to acrylics. She is currently working on an acrylic series called The Night Garden inspired by her visits to public gardens in the fall when things are dying and drooping. True to form, she paints on site, takes tons of pictures and then retreats to her studio to sort it out. “The paintings are completely abstract. There’s nothing recognizable,” she says. Sabrin continues to be struck by the beauty in nature and everyday things. “There is a lot of beauty in the world, and you don’t have to look very far to find it,” she says. “I want to call people’s attention to that.” A Fresh Look invites us all to see the world in a beautiful way.